Commanding breathtaking views of Bali’s Bukit Peninsula, surrounded by charming rural landscape, and boasting colourful gardens and luxurious style, Villa Indah Manis is an ideal choice for an event villa in beautiful Uluwatu. Adjoined by the self-contained one-bedroom Villa Indah Manis Bulan Madu – a honeymooner’s heaven with its own plunge pool – Villa Indah Manis boasts five bedroom suites, an elegant living and dining pavilion, fitness, spa, media and games rooms and 16-metre swimming pool with shallow area for the kids. Villa Indah Manis’ main garden offers space for the same number of guests across its flat green lawns, while the dramatic 16m pool can be converted into a temporary dance floor or stage while all the bedrooms are housed in separate pavilions for complete privacy from the main living/dining areas.The modern Balinese architecture makes use of local materials, such as white Palimanan stone, teakwood and sandwash, together with ‘sirap’ ironwood shingle for the roofs. On a clear day, the awesome vista takes in the ocean, the south coast of Bali and the silhouetted peaks of distant volcanoes. This beautiful area boasts some of the most idyllic beaches in Bali, including Balangan, Dreamland, Bingin and Padang Padang. These hidden, white sandy coves are great for both surfers and non-surfers alike. 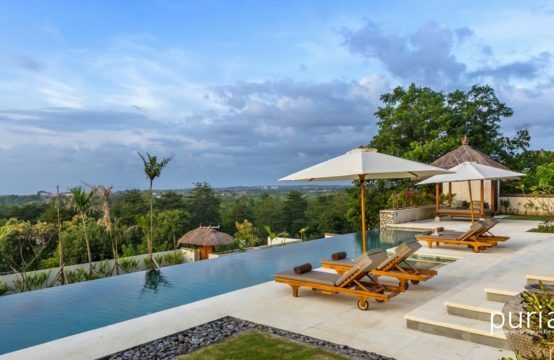 Villa Indah Manis is designed for large groups of friends and family as well as for weddings and other celebrations, and is thoughtfully built to capture the cool ocean breezes even at the hottest time of year, offering a blend of air-conditioned comfort and tropical open-air living. The villa chef and his excellent team are on hand for all meals and a full service kitchen provides facilities to cater for up to sixty guests. Blessed with sea views over the treetops, the semi-open-air living and dining pavilion is the social heart of Villa Indah Manis. A place to congregate in fan-cooled comfort enhanced by fresh breezes drifting in through the room’s open front, which leads out onto the pool deck. This large pavilion, with its soaring bamboo-lined roof, is flanked by a fish-filled lily pond and serenaded by the sound of bubbling water. A dining table for ten lies at one end while at the other guests can relax on sofas and lazy chairs. After dark, the pavilion takes on a different persona, softly lit with two impressive wrought iron chandeliers and surrounded by the mellow glow of garden lamps, its glamour is enhanced by the distant lights of Kuta and Seminyak twinkling across the ocean. Below the living pavilion and pool deck, the media room is a cosy, air-conditioned den, decorated in warm deep orange tones, harmonised with rich silk cushions. In this little snug, families can get together, sink into the comfy sofa and watch TV or choose from a wide variety of movies on the Movie Box or from a library of DVDs. Surround-sound completes the home theatre experience. An alternative option is to settle down for an evening of board games, selected from the big stack on the shelf unit; there’s even a Mah Jong set. Apart from the beautifully landscaped gardens most of Indah Manis’s outdoor activity takes place around the main living pavilion, where a row of sun loungers are arranged on the deck to one side of the pool, and a thatched cabana bar and alfresco dining table at the other. The lighting here at night is stupendous and is guaranteed to get the party started. Downstairs below the pool deck is the open-sided games room with pool table and darts board, the spa and gym, and a petanque court. 10 adults plus four children in five (six including Bulan Madu) ensuite bedrooms. Semi-open-air living and dining room; air-conditioned media room; outdoor dining on the terrace; poolside bar. Indah Manis is a superb event villa. Celebrations for up to 60 guests can be arranged at the villa with prior notice. Car and driver available for 8 hours at a special rate of USD25++/day (excludes petrol).